I think I forgot to attach the files…sorry about that. I am not sure if i am looking in the wrong place but i cant find any attachments? Here are your production documents. I noticed that the strings are cut flush to the first step, yo might want to add a bit of material to front of the stringers so that the first step housing is not exposed. I hope you enjoy building this. Love to see how it goes if you can keep us updated on progress. All looks good please proceed with stairfile. 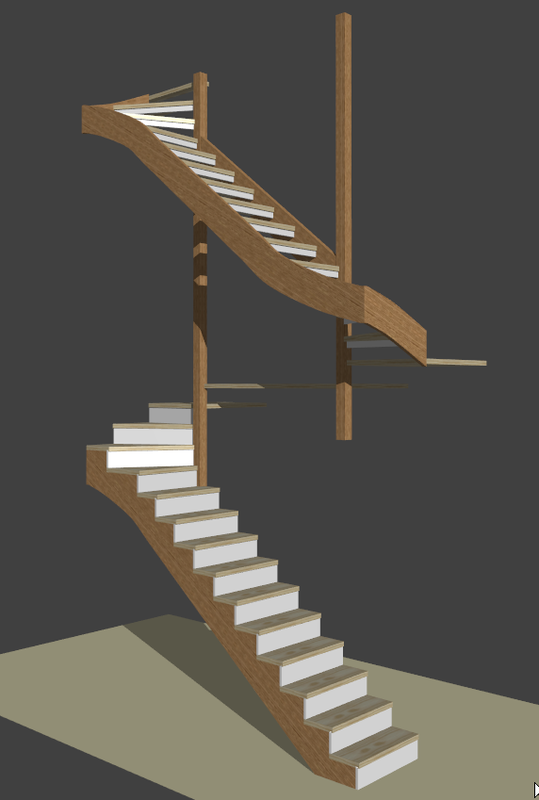 Here’s your stair model set up as you requested. Please check this over carefully tell me if this is OK for processing the manufacturing documents. I would prefer to keep the stringers straight only because I have to recess them into the wall and it will be much easier with straight lines rather then curved. I have not specified a rebate for the riser in the upper staircase because I plan on removing the risers after the building certification (we have a building code in Australia that requires a maximum of 170mm gap in an open riser). And have also left it out of the lower staircase as it will make it easier to manufacture the parts as I will only have hand tools and allows a smaller nosing, but a 10mm nosing is probably better as you suggested. If we could change the string to newel penetration to 5mm that will help me locate the position and use bolts as suggested. I have left the newel overlap at 600mm so I can just overlay the templates to the exact position on a single full length newel once the stairwells are cut and i have the perfect dimension. Thanks for buying a StairFile and posting you project. Although you haven’t posted the details of you stair well, your stair project seems well set out and should work construction wise. I would personally make a few adjustments but this is more a personal matter than a technical obligation. – There is no penetration of risers into the underside of the step, how are you thinking of assembling step to risers? I would set a 10mm penetration to groove the risers into the steps. – string are set to penetrate the newels 30mm. It’s possible to route a housing for the string into the newels to maintain the string position while using bolts to join the two. However, in this case the housing depth should not exede 5mm. If you have a 30mm penetration you should change this to a mortise and tenon. If building by hand (not using cnc) I personally would prefer a bolt and dowel or biscuit joint and would set the string penetration to 0. – the last post of the each stair are placed on top of one another but they are overlapping by 600mm, maybe you set this to have some waste to cut them on site? However you could just set them to sit on one another, this doesn’t stop you adding a few centimeters to adjust on site but 600 on each makes for a lot of extra wood. 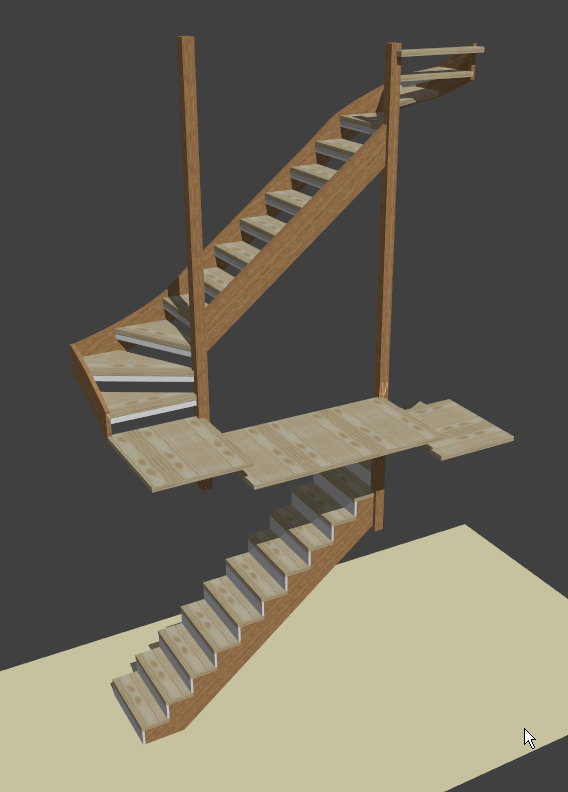 I attach your stair with these modifications, tell me what you think. Finally ready for the stairfile, I plan to use scale templates to cut all the pieces. The outside stringers for flights 4,5,6 will be recessed into the wall behind the plasterboard so there aesthetics are not a concern.